Aerotec (Brésil) Sociedade Aerotec Ltda., EngenhariaAeronautica formed 1968. Sociedade Aerotec Ltda., EngenhariaAeronautica formed 1968. Designed and built Uirapuru which, as T-23, was ordered by Brazilian, Bolivian, and Paraguayan air forces and civil flying clubs. In the Brazilian Air Force the T-23 succeeded the locally built Dutch Fokker types. Developed A-132 Tangara as potential replacement for T-23 (first flown 1981) but further developed into A-135 Tangara II. Aerotec also produced wings for EMBRAER Ipanema agricultural aircraft, starter pods, and components. Sociedade Avibras Ltda. in 1963 was testing prototype of A-80 Falcao, a side-by-side two-seat low-wing monoplane of wooden construction with plastic skin. Brazilian government contracts received for several projects, including single-seater with Volkswagen engine, but in 1967 the company withdrew from the aviation industry. Companhia Aeronautica Paulista formed at Sao Paulo shortly after the Second World War to produce CAP 1 Planalto low-wing advanced trainer, CAP 4 Paulistinha high-wing cabin monoplane, and similar CAP 5 Carioca. The second was the most successful; improved version later built by Nieva (q.v.). Company came under control of IPT (q.v.) in late 1940s. CENTRO TECNICO DE AERONAUTICA ==> above CTA. Companhia Nacional de Navegagao Aerea, took over manufacture of Muniz-designed aircraft from Companhia Nacional de Navegagao Costiera (CNNC, q.v.) around 1941. Produced Muniz M-11 two-seat primary trainer, designated HL-1, with strong resemblance to Piper Cub; batch of 50 HL-6 tandem two-seat low-wing monoplane trainers was begun 1943. Other designs included HL-2 and HL-4. In 1947, improved Series B versions of the HL-1 and HL-6 appeared; the company's activities had ceased by about 1950. Companhia Nacional de Navegagao Costiera, founded at llha do Viana, Rio de Janeiro, in late 1930s to manufacture Muniz-designed M-7 and M-9 biplane trainers; basically an Army aircraft workshop. In early 1940s renamed Fabrica Brasileira de Avioes (q.v. ); see also Muniz. COMPANHIA NACIONAL DE AVIOES LTDA ==> below CONAL. The name stands for Companhia Nacional de Avioes Ltda. A prototype five-seat high-wing cabin monoplane Conal W-151 Sopocaba was designed and flown in August 1964, but none was produced. The company was licensed for conversions of the Dumod I and Dumod Liner made by the Right: Conroy Airlift, American Dumod Corporation (q.v. ), but apparently none an outsize Canadair was built. Originated May 1940 as government-backed private company under French designer Rene Couzinet (q.v. ), at Lagao Santa, Minas Gerais, to build civil and military aircraft. First license was for North American NA-16 (AT-6 Texan see North American) advanced trainer, but none produced. Centra Tecnico de Aeronautica, established at Sao Jose dos Campos as aeronautical research center in late 1950s by Brazilian Air Ministry; CTA originally had two divisions. A group within the IPD (Research and Development Division), Departamento de Aeronaves (q.v.) or PAR, was responsible for the BF-1 Beija-Flir (Humming Bird) two-seat helicopter, first to be designed, built and flown in Brazil. Centra Tecnico Aerospacial developed reengining program for Paulistinha lightplane, with IMAERTM 2000 EM1 piston engine, as Paulistinha 65. Xingu transport, EMB-111A Patrulha for maritime surveillance, and Xavante (license-built Italian Aermacchi jet trainer and attack aircraft). Privatization completed in December 1994, with the Brazilian Federal Government retaining some 15 per cent of capital. Production in 1999 included the EMB-312 Tucano turboprop trainer (first flown August 1980), EMB-314 Super Tucano (first flown May 1993) and ALX special application version, EMB-120 Brasilia regional transport (first flown 1983), ERJ135 37-passenger regional jet (first flown July 1998), ERJ145 50-seat regional jet (first flown August 1995), and surveillance versions of the ERJ145. International program is AMX combat aircraft with Aermacchi and Alenia of Italy. Divisions of EMBRAER include Industria Aeronautica Neiva SA(q.v.). Assumed responsibility from CNNA for continued production of M-7 Gipsy Major powered primary trainer and M- 9 advanced trainer with Gipsy Six engine, designed by Lt Col A. M. Muniz. Acquired license to build Fairchiid PT-19 in 1942. Initial production of 100 Fokker S-11 two-seat primary trainers, followed by 50 examples of S-12 tricycle-landing- gear version. Five S-14 Mach trainers assembled from Dutch-made components, before construction of 45 locally manufactured aircraft. Former naval workshops which built aircraft for Brazilian Air Force, including Focke-Wulf Fw 44 primary trainers and Fw 58 twin-engined advanced trainers. In 1946 a batch of Fairchild PT-19 trainers was built under a license agreement. HELIBRAS ==> below Helicopteros do Brasil SA. Industria Aeronautica Brasileira SA produced in the late 1960s a two-seat lightweight primary trainer/sporting aircraft under the designation IABSA Premier 64-01. A single-seat aerobatic biplane, the IABSA Aerobatic 65-02, was under development. INDUSTRIA AERONAUTICA BRASILEIRA SA ==> above IABSA. Formerly Sociedade Construtora Aeronautica Neiva Ltda, and since March 1980 a subsidiary of EMBRAER, when all work on the EMBRAER/Piper series of light aircraft and production of the EMB-202 Ipanema agricultural aircraft were transferred (over 780 built). Including earlier company, Neiva has produced over 3,200 aircraft since 1956, many under license from Piper and including Ipanemas, Urupema gliders, Cariocas, Coriscos, Tupis, Minuanos, Sertanejos, Senecas/Cuestas, Navajos, and Carajas. INDUSTRIA PARANAENSE DE ESTRUTURAS LTDA. Developed IPE 06 Curucaca very light tandem two-seat monoplane (first flown 1990). INSTITUTO DE PESIQUAS TECHNOLOGICAS ==>below IPT. Institute de Pesiquas Technologicas (National Institute of Technical Research) was concerned primarily with research into materials suitable for use by the national aircraft industry. Was also responsible for the construction of a small number of lightweight cabin monoplanes. Formed early 1950s to build Mignet H.M.310 Estafette two-seat modernised version of the designer's earlier Poudu- Ciel light aircraft; new development flown 1951 with Continental A90 engine. Established at Sao Paulo; developed Casmuniz 52, first all-metal twin built in Brazil. Designed for short-field, limited- maintenance operations, with two Continental E185 engines. The four/five-seat Casmuniz 52 was first flown in April 1952 and subsequently taken over for flight test and production by Oficina de Mantencao e Recuperacao de Avioes Ltda. NEIVA ==> below Sociedade Construtora Aeronautica Neiva Ltda. The works at Rio de Janeiro's military air base built Waco biplanes for Brazilian Air Force mail services in late 1930s, plus Muniz two-seat training monoplane. Engineering School of University of Sao Paulo took over former IPT (Instituto de Pesquisas Technologicas research institute) 1975. Produced prototypes. First flight of IPAI- 26 Tuca two-seat aerobatic lightplane 1979. Other aircraft included IPAI-27 Jipe Voador (former SP-18 Onga), IPAI-28 Super Surubim, IPAI-29 Tira Prosa and IPAI-30. Neiva produced Model N621/T-25 Universal trainers for the Brazilian Air Force and a series of lightplanes. In March 1980 it was renamed Industria Aeronautica Neiva S.A (q.v. ), as a subsidiary of EMBRAER. SUPER M.M. ROTOR INDUSTRIA AERONAUTICA LTDA. Developed AC-4 Andorinha single-seat autogyro (first flown 1972) and M-1 Montalva two-seat autogyro (first flown 1985). In 1875, Júlio Cesar Ribeiro de Souza, born in belém, a city located in northern brazil, started some research in aeronautics because he was impressed with the flight of certain native birds of the amazon rain forest. he moved to rio de janeiro, where he published works on air navigation and presented talks on this subject to the instituto politécnico, an engineering faculty. he designed a dirigible, which was christened victória after his wife. after obtaining part of the funding in brazil, the device was constructed in paris. attempts to place the device airborne failed both in france and in brazil. back to his native city he created a workshop to produce hydrogen gas for the machines that he invented. júlio finally succeeded with his dream of pursuing the air navigation with the flight of another dirigible, called cruzeiro, in 1886 in paris. 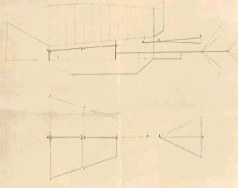 drawing belonging to the patent request for the dirigible victória designed by júlio cesar de souza (1881). another brazilian, Severo Augusto de Albuquerque Maranhão, born in macaíba, rio grande do norte state in the northeast of brazil, designed and flew the dirigible bartolomeu de gusmão in rio de janeiro in 1894. he also developed and constructed a second machine, the pax. two four-cylinder buchet engines with 16 and 24 hp powered the pax. two pusher propellers set at 50 rpm drove the aircraft. the forward and aft propeller diameters were 5 and 6m, respectively. in addition, two other propellers were placed normal to the machine's longitudinal axis for lateral control, only. a further propeller was placed below the deck and was employed to control the pitch movement of the 30-m-long aircraft. maranhão had some insights in designing the pax, which were not taken into account by his predecessors. one of them was the placement of the traction line coincident with the drag one to better control and handling of the aircraft. however, he unfortunately died during his flight on the pax in mai 12th, 1902 in paris. dirigible bartolomeu de gusmao in rio de janeiro, 1894.
source: museé de l’air, france. 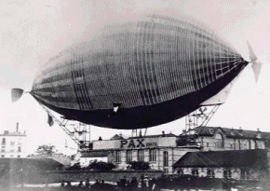 the dirigible pax designed by severo maranhão was constructed in paris. The aviation also changed after the Brazilian Alberto Santos Dumont. Alberto Santos Dumont was born on July 20th, 1873, in the village of Cabangu, State of Minas Gerais, Brazil. At the age of 18, his father sent Santos Dumont to Paris where he devoted his time to the studies of chemistry, physics, astronomy and mechanics. He had a dream and an objective: to fly. In 1898, Santos-Dumont went up in his first balloon. It was round and unusually small and he called it Brésil (Brazil). However, it was capable of lifting a payload of 114.4 lb, and had in its lower part a wicker basket. His second balloon, "America," had 500 m3 of capacity and gave Santos Dumont the Aero Club of Paris' award for the study of atmospheric currents. Twelve balloons participated in this competition but "America" reached a greater altitude and remained in the air for 22 hours. Between 1898 and 1905 he built and flew 11 dirigibles. Contrary to the prevailing common sense at that time, he employed in his lighter-than-air aircraft piston-powered engines with the lifting-gas hydrogen. He won the Deutsch Prize, which was conceived and granted by the oil tycoon Deustch de la Merthe, when for the first time in the history a dirigible went around the Eiffel tower on October 19th, 1901. This prize amounting 100,000 Francs stipulated a dirigible ride comprised of a flight with takeoff and landing at the Saint-Cloud field with a total duration of 30 minutes, including the going around the Eiffel Tower. In 1904, Santos Dumont came to the United States and was invited to the White House to meet President Theodore Roosevelt, who was very interested in the possible use of dirigibles in naval warfare. The interesting thing is that Santos-Dumont and the Wright brothers never met, even though they had heard of each other's work. 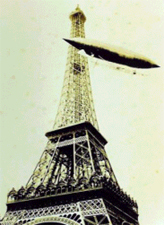 Santos-Dumont going around the Eiffel tower with its no, 6 dirigible on October 19th 1901. Louis Cartier invented the wristwatch for his famous friend, Alberto Santos Dumont, in March of 1904. They had met and become good friends in 1900. Santos Dumont's Deustch Prize conquest was celebrated at Maxim's that evening, and at some point Santos Dumont complained to Cartier about the difficulty of checking his pocket watch to time his performance. He wanted his friend to come up with an alternative that would permit him to keep both hands on the controls. Louis Cartier went to work on the idea and the result was a watch with a leather band and a small buckle, to be worn on the wrist. 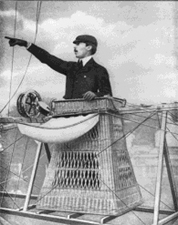 Santos-Dumont never took off again without his personal Cartier wristwatch. Santos Dumont also designed a helicopter, the picture of which was displayed on the cover page of the periodic "La Vie au Grand Air" of January 12, 1906. Due to technical difficulties to put such machine airborne, Santos Dumont pursued his dream of flying with a winged aircraft, instead. In 1906, Santos-Dumont took the nacelle of his dirigible balloon no. 14 and added to it a fuselage and biplane wings, whose cellular structure resembled the kites still found nowadays in Japan. An Antoinette V8 engine of 24 hp power was installed ahead of the wings, driving a propulsion propeller; the airplane flew rear-first and was denominated 14-bis (since it was descendent of the dirigible balloon no. 14). It had a wingspan of 12 m and 10-m-long fuselage, and had a tricycle fixed landing gear. Santos-Dumont developed what has to be called the first flight simulator, using winches and gears to let the 14-bis roll down a plan, while he learned how to control the plane. On 21 August 1906, Santos-Dumont made his first attempt to fly. He did not succeed, since the 14bis was underpowered. On September 13th, with a reengined 14bis (now with a 40 or 50 hp power engine which he obtained through Louis Bréguet), Santos Dumont made the first flight of 7 or 13 m (according to different accounts) above the ground, which ended with a violent landing, damaging the propeller and landing gear. On October 23th, 1906 his 14Bis biplane flew a distance of 60 meters at a height of 2 to 3 meters during a seven-sec-long flight. Santos Dumont won the 3,000 Francs Prize Archdeacon, instituted in July 1906 by the American Ernest Archdeacon, to honor the first flyer to achieve a level flight of at least 25 m. Before his next flight Santos-Dumont modified the 14-bis by the addition of large hexagonal ailerons, to give some control in roll. Since he already had his hands full with the rudder and elevator controls (and could not use peddles since he was standing), he operated these via a harness attached to his chest. If he wanted to roll right he would lean to his right, and vice versa. 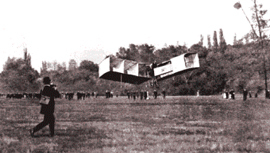 One witness likened Santos-Dumont's contortions while flying the 14-bis to dancing the samba! With the modified aircraft, he returned to Bagatelle on 12 November. This time the Brazilian made six increasingly successful flights. One of these flights was 21,4 sec long within a 220 m path at a height of 6 m. The Brazilian always used his Cartier wristwatch to check the duration of his flights. 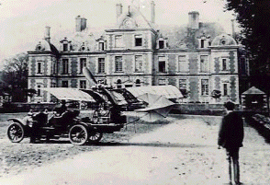 The flight experiments with the 14Bis took place at Le Bagatelle (air)field in Paris. Santos Dumont did not employ any catapult or similar device to place his craft aloft. As far as the world knew, it was the first airplane flight ever and Santos-Dumont became a hero to the world press. The stories about the Wright brothers' flights at Kitty Hawk and later near Dayton, Ohio, were not believed even in the US at the time. The dirigible no. 14 and the 14Bis during trials to evaluate its flight characteristics. The first sustained flight of a fixed-wing craft took place on October 23th, 1906 in France. The 14Bis flying on 12 November 1906. The new ailerons are clearly visible. The successful Demoiselle monoplane, which Santos Dumont employed as private transport. On the 7th January 1910, the first airplane constructed and designed in Brazil took off for its maiden flight in Osasco, São Paulo. 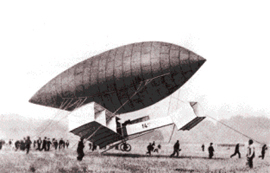 The aircraft was conceived by the Frenchman Demetre Sensaud de Lavaud and was very similar to the Bleriot designs. The first flight was only 6-sec long. Afterwards, several other flights followed and the airplane, known as São Paulo, attracted huge crowds during its flights exhibitions. The aircraft was 100% Brazilian-made (even the propellers and the engine were manufactured by Mr. Lavaud). It was the first of several other designs developed in Brazil and the event took place long before the country could see aircraft serial manufacturing. In 1899 in São Paulo the Strength of Material Laboratory of the Engineering Faculty Escola Politécnica was created. In the first years of its existence, the Laboratory performed tests with materials mostly employed in the civil construction. In 1926, the Laboratory evolved itself into the Laboratory for Material Testing also gaining research attributions and in turn gave later birth to the Instituto de Pesquisas Tecnológicas (IPT). The interest of IPT in aviation appeared from studies looking for application areas of wood in engineering. A report containing properties of numerous wooden elements, result of an extensive and systematic research, was published by IPT and was worldwide acknowledged. 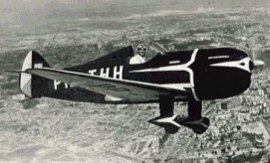 In 1938, Frederico Brotero and Orthon Hoover designed a monoplace aircraft of wooden structure. The first one of the four prototypes of the aircraft was constructed in the IPT facilities and finished in Rio Claro, a city located in the countryside in the State of São Paulo. The airplane was nicknamed Bichinho de Rio Claro (Rio Claro's mascot) but later it gained the IPT-0 denomination. The plane brought some aeronautical innovations, among them high-lift devices at wing leading edge, which became a standard feature for aircraft types developed later by IPT. The first prototype of IPT-0 was equipped with a 60-hp engine. The wing ribs and the fuselage were composed of freijó (Cordia goeldiana), a moderate-weight wood type, which was researched by IPT. The skin of IPT-0 was made of IPT-manufactured plywood. Bichinho was in operation until 1988. The experience gathered by making plywood elements for Bichinho enabled a creation of a unit for plywood manufactured at IPT, which started production in 1940. In 1943, engineers at IPT designed a new aircraft with more powerful engines ranging from 65 to 80 hp. Three prototypes had been constructed, each of them with a different motorization. All aircraft presented outstanding flight characteristics. In 1948, the Divison of Aeronautics of the IPT was created, originated from the Section of Aeronautics. The IPT designed a glider for primary instruction, the Gafanhoto, which was designated IPT-1. A public-domain report was published by IPT containing the required information to build the glider. The IPT-2 aircraft, also a glider, was nicknamed Aratinga and performed its maiden flight in July 1942. IPT built 17 different types of aircraft along its aeronautical activities. In early 1951 Prof. Heinrich Focke moved to Brazil. He was head of the former Focke-Wulf Flugzeugbau AG, which designed and manufactured the Fw 190, considered by many specialists one of best fighters of the World War II. At Centro Técnico Aeroespacial (CTA), Prof. Focke conducted some ground tests with a vertical takeoff and landing aircraft, the Convertiplano. The BF-1 Beija-Flor helicopter was a Prof. Focke design from 1956, at this time still working at CTA. A two-seater, the Beija Flor had its 225hp Continental E225 engine fitted in the nose, with a short coupling to the rotor pylon, which was mounted centrally in front of the crew. An open structure tubular steel tail boom carried a pair of tail surfaces and a small tail rotor. The prototype flew on 1st January 1959, and performed an extended flight-testing campaign until it was damaged in an accident. It is thought that further work on the Beija Flor was then abandoned. A group of engineers working at IPD, an institute belonging to CTA, designed and built the twin-engined Bandeirante, an all-metal aircraft conceived to transport 20 passengers and that was able to operate at unpaved airfields. The Bandeirante was later manufactured by Embraer, which designed stretched civil and military versions of the type. At the end of the 80s, the CTA adapted an aeronautical piston-powered engine to use ethanol as fuel. A Brazilian made T-25 Universal military trainer aircraft equipped with this engine successfully flew in 1989. Currently, there is research being conducted to introduce this kind of engine to agricultural airplanes. Convertiplano’s fuselage and engine workbench. The aeronautical activities of IPT and CTA led to necessary knowledge and the education of specialized people to support the modern Brazilian aircraft industry, which was born in the 60s and early 70s. Currently, Brazil has the fourth largest commercial aircraft manufacturer in the world, which has significantly contributed to the development of the regional aviation worldwide with comfortable, modern, and efficient designs.